Is there a cathedral in that puddle? 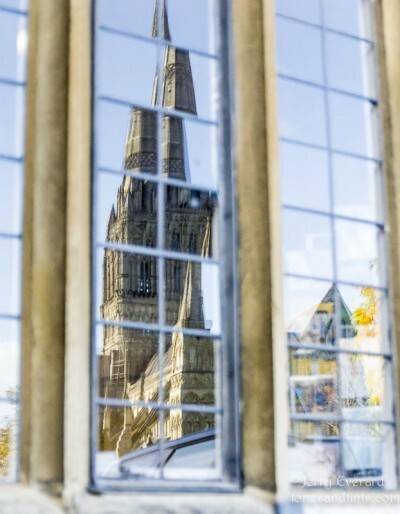 I used a wide aperture lens out to f2.8 in order to ensure that the focus would be on the cathedral, while leaving the window frame a little out of focus. 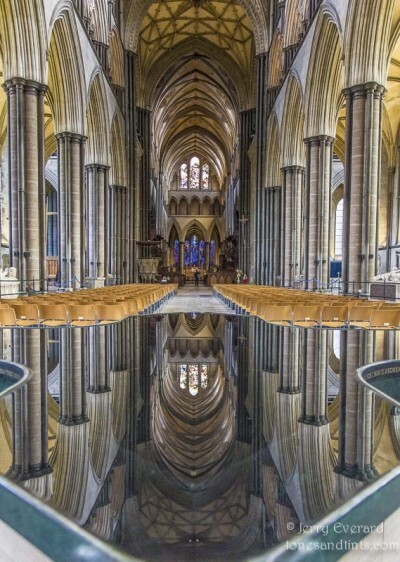 Sometimes you can find great reflections inside too – the modern font in the cathedral provides a wonderful reflective surface in which to mirror the main windows. The font was designed by William Pye and is the first permanent font for over 150 years. It was commissioned over ten years ago by by the then Canon Treasurer and now Dean of Salisbury, the Very Revd June Osborne. The font is three metres across and constructed as a bronze cruciform vessel atop a purbeck marble plinth. The water flows constantly, but the font is so constructed as to provide a perfectly smooth surface.